C3 isnt labeled for value? Yes. 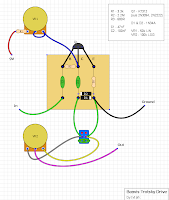 That adds/removes that C3 cap on and off from the circuit, which should be 22n according to Beavis schematic. That switch is called "Bright Cut". I'm fairly new at this, so this may be a stupid question. Does this need to be a tagboard? Could I build this same circuit with a pad-per-hole board, if I can fit all the components into their respective holes? There is no point. I got an order, and they sent me the wrong boards, so I have a ton of PPH boards laying around with nothing to use them for. Figured maybe I could bang out one of these to not let the boards go to waste. Thanks! Just finished this one, love the sound (found some KT312V on ebay). Thanks a lot ! Our singer/guitarist took the one I build from me during last rehearsal ! We are huge fans of this circuit. I'm rebuilding another one and was wondering about changing VR1 pot for a log one : I aim to get more accurate settings for lower drives (my impression is that saturation increases really fast and I have max overdrive at 12h). What you think ? Good idea or stupid noob one ? Thanks anyway ! So the layout shows the transistor pins in the wrong order. Which one is correct: The pin names, or the transistor position? I've tested KT312 A, B and V with various hFE's. Sounds like a charm, a really cool overdrive never aggressive. I had also good results with Ge NPN transistors like AC176, even very leaky (I'm currently using one with hFE 84 and measured leakage near 590 uA). Sound then become warmer, much darker, but still interesting. Also tried NOS russian germanium : MP38A, GT404... (those were not leaky), great sound. I think this circuit maybe a good way to use leaky Germanium transistors, not usable in fuzz circuits.